I grabbed the Ulta3 spring collection at my local chemist a few weeks back during , but because I was in the middle of the 31 Day Challenge I haven't had a chance to show it to you it. This spring collection is very girly, and if you love pinks then this collection is for you. There are seven polishes in the collection and four of them are shades of pink. There is also a pink leaning purple, a pale yellow and pale blue. 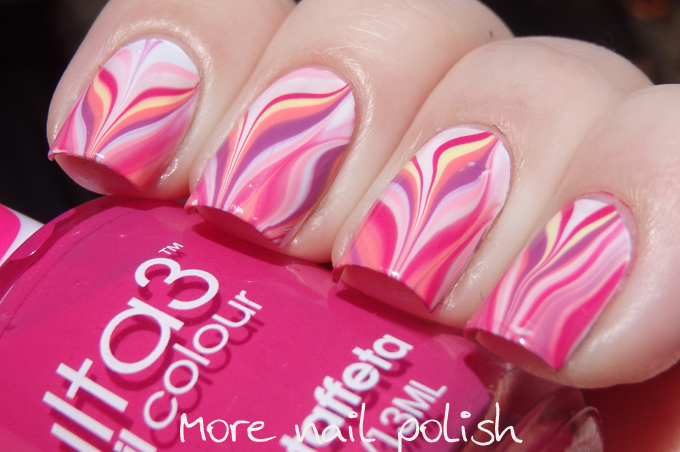 The colours really compliment each other, and I couldn't help wanting to try out another watermarble. 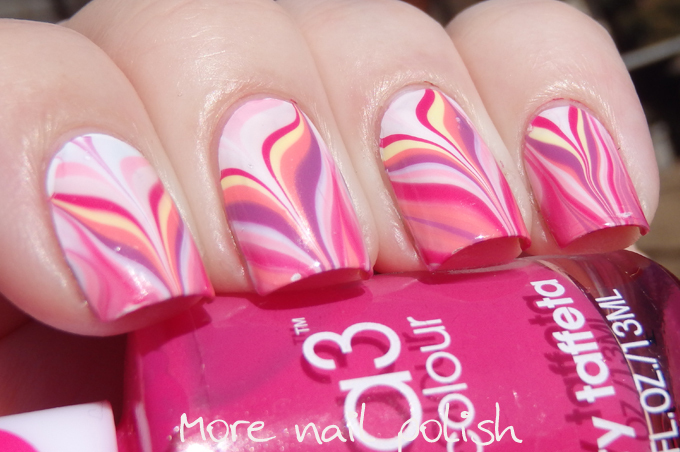 I haven't had much luck with Ulta3 polishes and water marbling in the past, but seeing as these were new bottles I thought they might work a bit better - it turns out I was right. 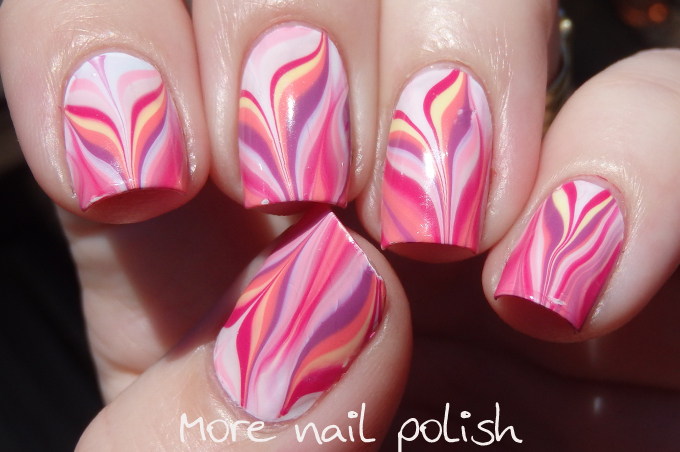 Newer polishes definitely work better for marbles because they spread on the water much better. Candy Mohair - a classic pale pink. Given the number of pinks in the Ulta3 range, I though this might be a dupe of another colour, but nope. The closest shade is Fairy Floss, but this is a much bluer pink, and Fairy Floss is a red pink. Three coats with Seche Vite top coat. Cherry Taffeta - A bright hot pink. Two coasts with Seche Vite top coat. 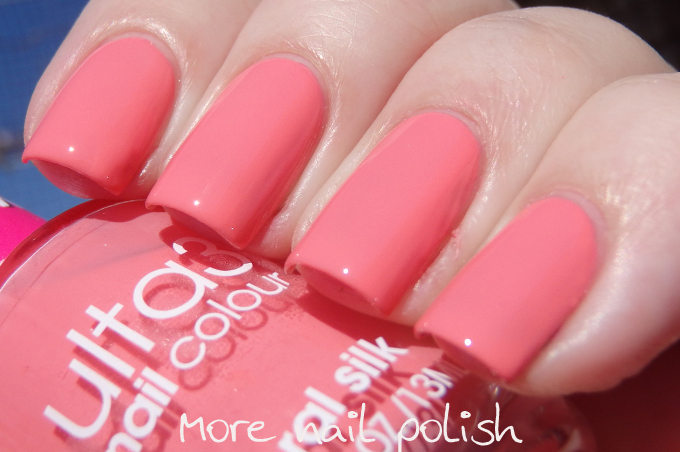 Coral Silk - a pastel coral pink. Closest shade is Fairy Floss, but this leans more orange. This is two coats with Seche Vite top coat. 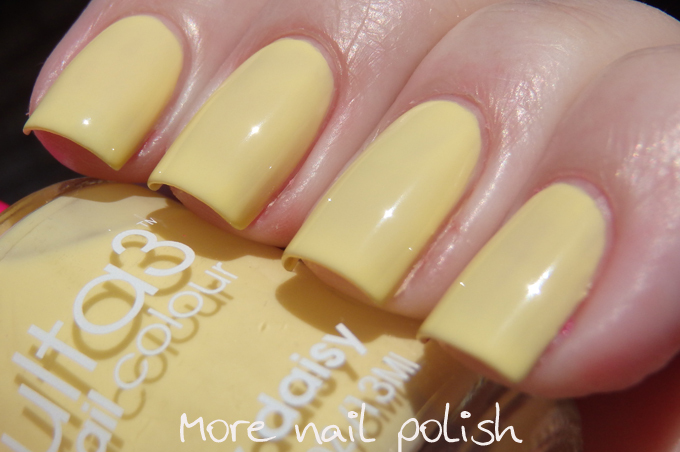 Lacy daisy - pastel yellow. 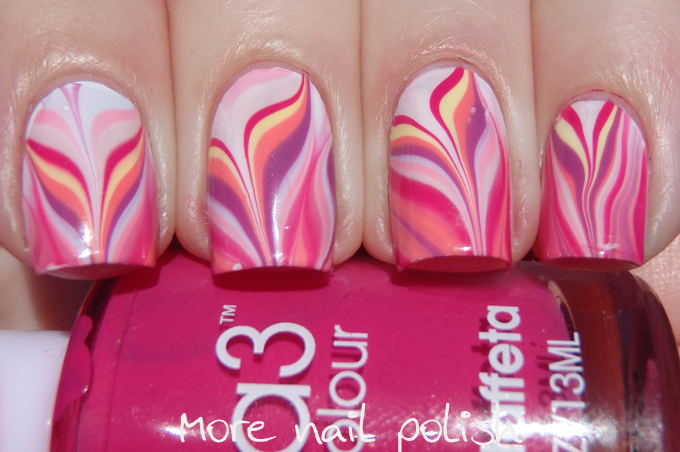 This one is a bit thin and a little patchy and it does take three coats for full opacity. Very similar to lemon tart, although lemon tart was only available in last years candy book. Radiant orchid - a beautiful representation of the pantone colour of the year. A pink leaning purple. This is two coats with Seche Vite top coat. Soft voile - a very pale pastel blue. Much much paler than the two other pale blue ulta3 shades, but it needs three coats to look it's best. This is three coats with Seche Vite. Woolly Days - a very pale mushroom pink. Similar to untold secret, but this has a creamier and more opaque formula. This is two coats with Seche Vite top coat. 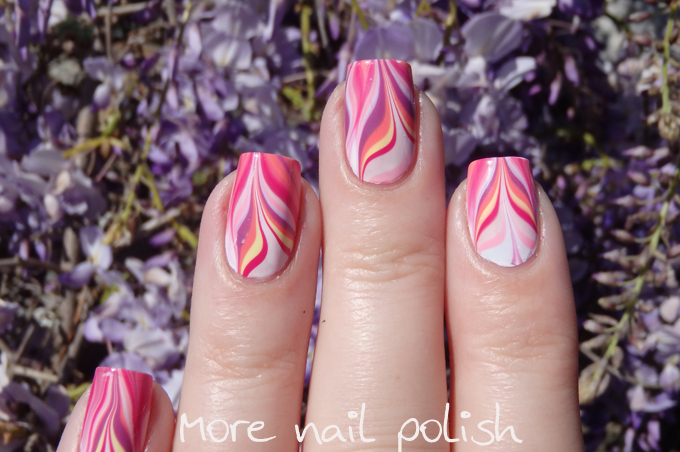 the colors don't seem too amazing to me, but your water marble is (again) gorgeous!